Hi, friends!! I hope everyone enjoyed their weekend. I squeezed in some TV time (so. many. shows.) but yesterday was a super productive day. I went to brunch with Ryan’s family and then me, him and his mom headed back to our condo to do some major cleaning. And I mean MAJOR! We are getting ready to put our place on the market so this was way overdue and honestly it felt great to throw out so much junk. Our place is spotless and let’s hope it can stay that way! 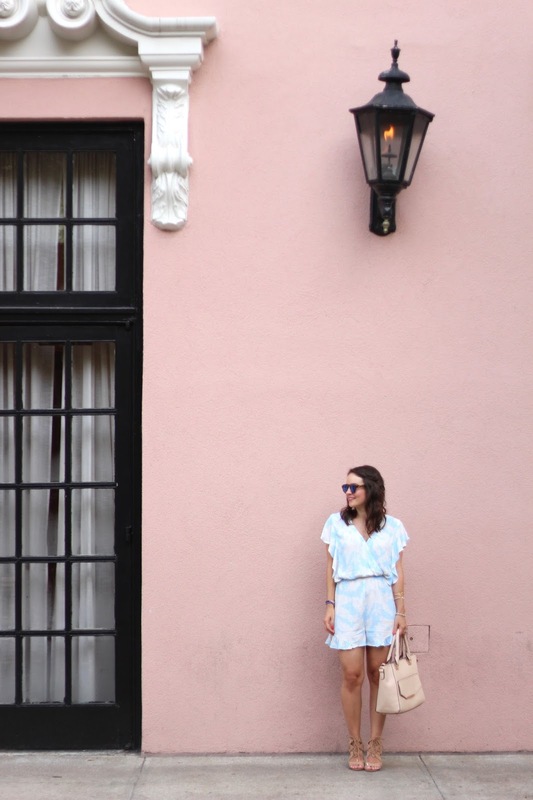 Today I’m sharing another outfit from Charleston from day two of #TBScon. When packing for this weekend, I knew that I had to pack light and breathable outfits. 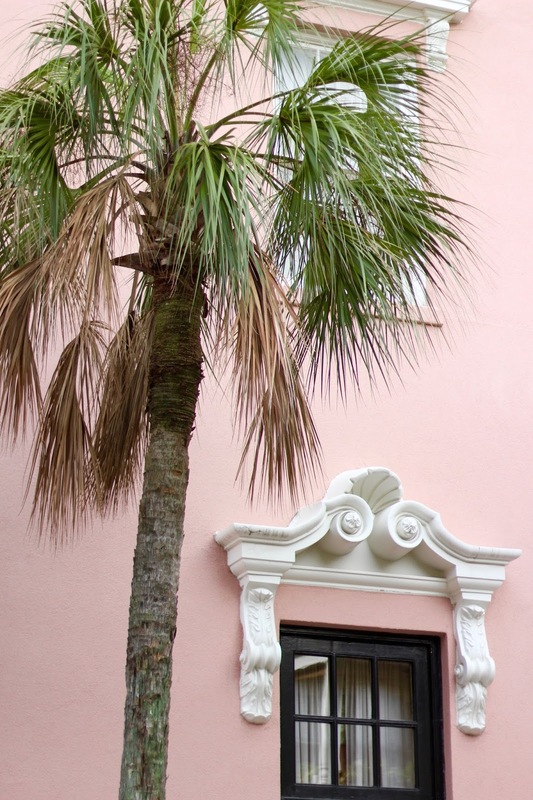 If you’ve ever been to Charleston, then you know the humidity hits you like a ton of bricks as soon as you step outside (especially in August). We took these photos around 9am with the sun beating down on us and it was a struggle, but we just couldn’t pass up a pink wall now, could we?? When I spotted this romper at H&M, I knew I had to snag it for the trip. It’s light, flowy, & feminine and also comes in navy if you’re looking for a more transitional piece. Ryan isn’t really into rompers (most men feel the same, I think) but he actually said “this wasn’t bad for a romper.” Progress, people!! To dress up my look, I paired the romper with my Sam Edelman lace-up sandals and pink tassel earrings. Speaking of earrings, does anyone feel like their earring holes are getting stretched out as you get older?? I love to wear statement earrings but this does worry me. When I was at the conference, Megan (I’m Fixin’ To) introduced me to the Kendra Scott lobe wonders and they truly saved the day. They are a medical grade tape that you place on the back of your ears to help support those heavier earrings and make them more comfortable. Needless to say, as soon as I got back in Charlotte I went to the store and got my own box. Trust me on this one! I popped into some boutiques this weekend and I think I’m officially ready for fall. Or at least slightly cooler September-ish weather. All the cute vests and booties are out and by this point in the summer, I’m pretty much over the pool and sweating to death. However, I am ready for one last beach trip and am counting down the days until I get to fly to Miami with my best girlfriends (17 days to be exact!). Thanks for reading and be sure to stop back by on Wednesday for the start of my wedding series! This romper looks perfect for the humid end-of-summer weather… so cute! I don't think fall is headed to Florida anytime soon, but I'm sure ready for cooler temps! Oh I love this romper!! 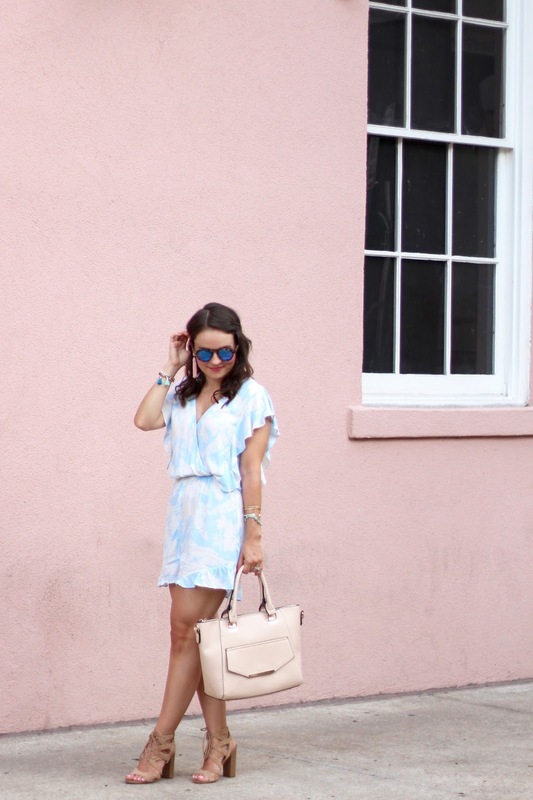 I have yet to try a romper, but this one makes me want to! Love the coloring in this romper! you look gorgeous! love this romper! This romper is so pretty! I'm going on vacation in 2 weeks and I 'd love to wear something like that! The CUTEST romper! And from H&M… major score! Super cute! Love the print, it looks like the Mara Hoffman print from this Summer but a fraction of the price. Great find! Oh gosh okay so Amanda dressed me in a romper one time and I ran back upstairs to grab something. When I walked in the door Jonathan just looked at me and asked if I was TRYING to look like a toddler. MEN! Also-texting you today about a possible popsicle date + house walk in our very near future…pretty please!